Comments: Deciduous Broadleaf native to China. Pinate dark green leaves with an even number of leaflets, rough brown bark, and erect seed clusters which are somewhat like those on a California pepper tree. Leaves turn to a vermilion red in the late fall. 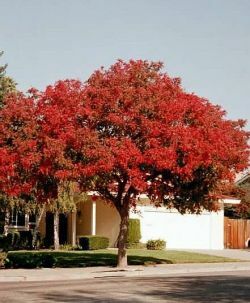 Broad spreading and relatively low height (40') make this tree ideal for curbside planting.